SEATTLE – Jacob Eason isn’t in Georgia anymore. 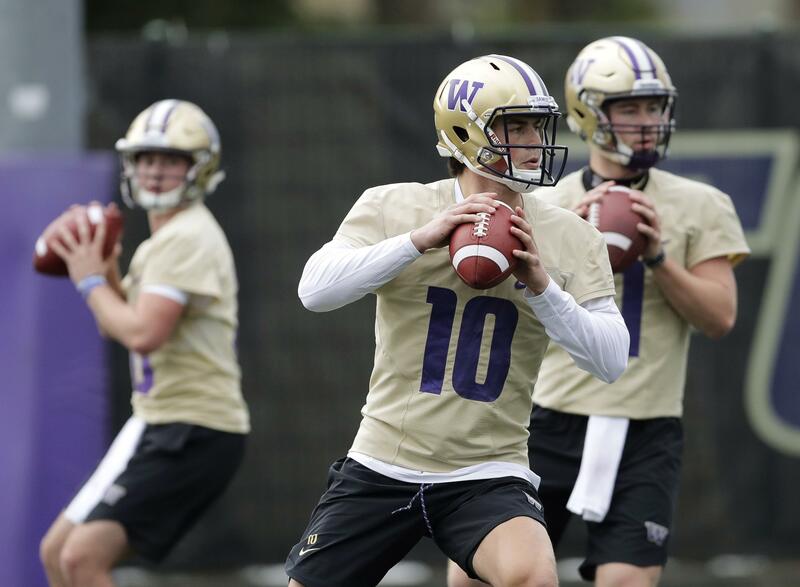 That much was evident when Washington opened spring practice on Wednesday, playing in T-shirts and shorts through a spitting rain and brisk temperatures on the east field just outside of Husky Stadium. But what else was evident in the first of 15 April practices? Here are some observations from the 2019 Huskies’ spring debut. Starting lineups, get your starting lineups: The Washington starters will likely fluctuate wildly throughout the spring. But on Wednesday, at least, both Eason and redshirt sophomore Jake Haener received snaps with the starting offense. The same goes for running backs Salvon Ahmed and Sean McGrew. The starting offensive line was set as follows: left tackle Trey Adams, left guard Luke Wattenberg, center Nick Harris, right guard Jaxson Kirkland and right tackle Jared Hilbers. The most notable entry there is Hilbers, who started 11 games at left tackle last season while Adams was injured. The 6-foot-7, 305-pound senior remains the most likely candidate to win the right tackle job vacated by the departed Kaleb McGary. Without Aaron Fuller, who was present at practice but did not participate with a minor injury, the starting wide receivers were often junior Ty Jones, senior Andre Baccellia and sophomore Terrell Bynum. The returning Chico McClatcher, who left the team midway through the 2018 season for personal reasons, worked in with the second unit and looked both healthy and explosive. Tight ends Hunter Bryant and Cade Otton both worked with the starters as well. On the defensive side, converted outside linebacker Benning Potoa’e, junior Levi Onwuzurike and redshirt freshman Tuli Letuligasenoa got starting reps on the interior of the defensive line. The starting inside linebackers were seniors Brandon Wellington and Kyler Manu, and the outside linebackers were sophomore Joe Tryon and junior Ryan Bowman. Junior Elijah Molden – who had previously operated as a nickelback – was a starting corner on Wednesday, opposite junior Keith Taylor. Molden and Taylor both made multiple plays breaking on balls, a promising development for UW’s traditionally stout secondary. Unsurprisingly, the starting safeties were the only ones who have played the position at the collegiate level – juniors Brandon McKinney and Isaiah Gilchrist. McKinney notably recovered a fumble on Wednesday. If we’re going further down the depth chart, quarterbacks Colson Yankoff – a Coeur d’Alene High grad, Jacob Sirmon and Dylan Morris all shuffled in behind Eason and Haener. Tailbacks Richard Newton and Kamari Pleasant got plenty of work as well. The second-team offensive line consisted of left tackle Matteo Mele, right guard M.J. Ale, center Cole Norgaard, right guard Henry Roberts and right tackle Henry Bainivalu. In the hotly contested cornerback battle, redshirt freshmen Kyler Gordon and Dom Hampton both worked with the second group. The second-team safeties were converted wide receiver Alex Cook and early enrollee freshman Cameron Williams. We’ll attempt to fill out the depth chart more as the spring rolls on. The first of many QB competition updates: Haener got the first snap with the starters in scrimmage drills on Wednesday. The sophomore also made the most noticeable mistake, when he lofted a pass over the middle that early enrollee freshman linebacker Josh Calvert jumped for an interception. Eason appeared to have an immediate connection with junior tight end Hunter Bryant, as the former Georgia quarterback hit Bryant twice with crossing routes over the middle during a 7-on-7 drill. Outside of Eason and Haener, the most noteworthy quarterback play was made (unfortunately) by redshirt freshman Colson Yankoff, who threw a pick-six to senior defensive back Dustin Bush. Irvin slides to safety: As previously noted, McKinney and Gilchrist are the only two Husky safeties who have previously played the position at the collegiate level. But help may be on the way. Highly touted redshirt freshman Julius Irvin – who primarily played safety in high school but was positioned as a cornerback last season – participated with the safeties during individual drills on Wednesday. Irvin, who missed the Rose Bowl with an arm/shoulder injury, appeared to be limited and did not take part in any scrimmage drills. Pleasant, Newton bulk up: Washington noticeably lacked a power running back last season. The Huskies may now have a pair this spring. Maybe that’s an exaggeration, but both junior Kamari Pleasant and redshirt freshman Richard Newton appeared to have added significant muscle this offseason. On the spring roster, Newton jumped from 195 to 213 pounds, while Pleasant packed on 11 pounds to bump from 204 to 215. They both could provide a nice complement to Ahmed (193 pounds) and McGrew (184). Injury updates” Washington head coach Chris Petersen said following Wednesday’s practice that Fuller had a minor procedure this offseason and is not expected to miss much time. The Huskies’ top returning wide receiver appeared relatively healthy throughout the practice, helping with his position’s individual drills and even standing in and fielding several punts. Petersen also confirmed on Wednesday that senior linebacker D.J. Beavers’ status is uncertain as he recovers from a lower leg injury suffered during the Rose Bowl. The 6-1, 211-pound Beavers was not at practice on Wednesday and will not participate this spring. Published: April 3, 2019, 2:55 p.m.